Electrical and computer engineers develop and create products that change the world and make our lives easier. The cell phones we depend on, the computers used in national security, and the electrical systems that make our cars operate were all created by electrical and computer engineers. At WPI, we keep that progress moving forward with our innovative research and out-of-the box approaches. The Department of Electrical and Computer Engineering (ECE) at WPI challenges students to push themselves to understand society’s and technology’s complex issues in a broader context than what’s in front of them. We want our students—whether they are earning an undergraduate minor or a doctorate—to tackle society’s most pressing problems and uncover new ways of solving them. Whether it’s developing systems that can locate firefighters in the middle of a burning building or creating neuroprosthetics that look and function like natural limbs, our faculty and students are at the front edge of remarkable innovation. While advancing technologies is at our core, we also take human connections very seriously in ECE. We pride ourselves on the family-like atmosphere we cultivate; faculty, students, and staff encourage each other’s every success and are there for the challenges both in the classroom and in life. As members of WPI's Vernam Group, Berk Sunar and Thomas Eisenbarth search for vulnerabilities in the remote storage and computing services known collectively as "the cloud." Cloud computing, which makes it easier and less expensive for companies to scale up their operations, has helped enable the rapid expansion of firms like Netflix and Dropbox. 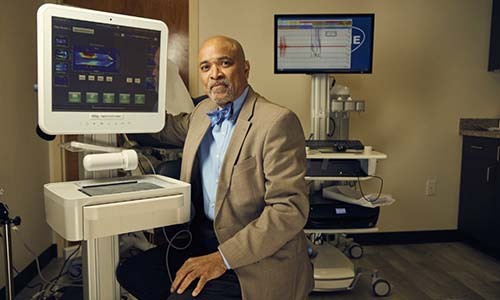 Electrical engineering alumnus Lennox Hoyte '79 found his life’s work at the intersection of healing and engineering: developing predictive models, informed by high-tech imaging and big data algorithms, that can help women make informed choices about their medical care.